After giving birth to a son, battered Elena Maldonado accepts a ride home from Luis Gonzalo, the sheriff of Angustias, Puerto Rico, but refuses his suggestion that he take her somewhere else, safe from her alcoholic husband Marcos. Elena announces that she’s divorcing Marcos; she and Gonzalo even stop briefly at lawyer Maria Garcia’s house en route. Gonzalo’s wife Mari takes his failure to convince Elena personally; when the new mother is murdered later that day, the devastated Mari takes charge of her nameless child. It seems like an open-and-shut case when Marcos, clearly drunk, tries to avoid arrest by escaping. Elena’s drunken father Perfecto, cut from the same cloth as her husband, takes the news just as hard. While hulking deputy Wilfrido Vargas is transferring Marcos, Perfecto attacks his son-in-law with a knife, nearly killing him, before fatally turning the weapon on himself. Meantime, several developments shake Gonzalo’s certainty in Marcos’s guilt. Neighbors report that Elena had a boyfriend. Marcos recently inherited property valued at several million dollars. And while retired deputy Emilio Callazo is keeping watch inside the Maldonado home, he interrupts an intruder and gets a beating. 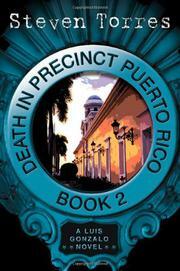 Gonzalo’s other deputies, loose cannon Hector Paredo, vain Guillermo Estrada, and super-serious Iris Calderon, have less to do than in their debut (Precinct Puerto Rico: Book One, 2000), but add texture by their handling of lesser local crimes and their assistance on the Maldonado murder. A solid police procedural with an involving murder puzzle and an ever-deepening portrait of Angustias at its core.